Every Indian might be aware about Aadhaar Card but to still make all of you aware let’s define Aadhaar Card in few words. Aadhaar is a 12 digit unique number issued by Government of India as a proof of Identity and hence Aadhaar Card now days have been also accepted as Proof of Address. The Aadhaar authority maintains all our demographic data and well as biometric data which where captured during Aadhaar Enrollment Process so in future government can use it in various places like Courts, Airports, and other Criminal Activities to track the identity of the person easily through Aadhaar Number. So now let’s move on to our main topic on how to download Aadhaar Card Online below guide will educate you throughout the process of downloading Aadhaar Card. e-Aadhaar Card Letter can be obtained through online portal easily if you are having your Aadhaar Card Enrollment Slip with you or with Aadhaar Number. If after waiting for long you have not received your Aadhaar Card through post on your postal Address you might not worry as you can download e-Aadhaar Card Letter Copy Online through official portal and can be used for various purposes same as original Aadhaar Card which you get it through post. If you have received SMS on your mobile saying your Aadhaar Number have been successfully generated in that case also you can get your Aadhaar Card downloaded through Online Portal instantly just you will need your Aadhaar Number or Aadhaar Enrollment Slip. So now let’s move on to process of downloading e-Aadhaar Card Letter. Go to Official Aadhaar Portal by clicking here. If you have Aadhaar Enrollment Slip than you have to select I have Enrollment ID or else if you have Aadhaar Number you have to select Aadhaar and enter the further details Enrollment Number/ Aadhaar Number in below text box. 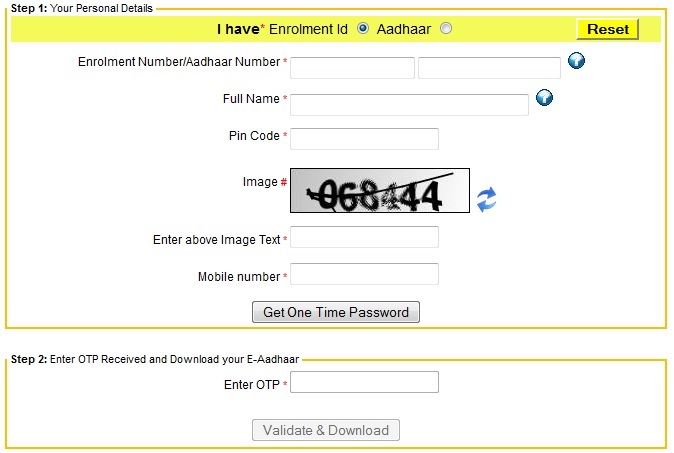 Next you will have to enter the full name as it appears in the Aadhaar Enrollment Slip, followed by Pin Code, than fill out the captcha which placed for security purpose to avoid bots or spam, next you will enter active mobile number as you will receive OTP (One Time Password) on your mobile and then you will have to click on Get One Time Password and as soon as you receive the OTP on your mobile through SMS you enter it in below textbox Enter OTP. Next you will have to hit validate and download and your e-Aadhaar Card Letter PDF will get downloaded. 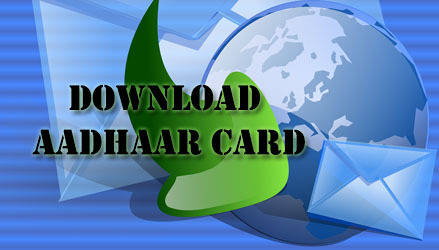 After successful download to open the e-Aadhaar Card Letter you will need PDF Reader one of the best PDF Reader is Adobe Reader which you can download it by clicking here. If you already have Adobe PDF Reader than well in good and open the downloaded e-Aadhaar Card Letter, next it will prompt you to enter the e-Aadhaar Card Letter password so you will have to enter your pin code which is also known as postal code enter it correctly and your e-Aadhaar Card Letter will be unlocked and you will able to see your Aadhaar Card. Next if you want hard copy of your Aadhaar Card validate the signature by clicking validity unknown icon and follow the on screen process and print your e-Aadhaar Card Letter so than you can provide the hard copy of Aadhaar Card for various purposes. Hope after reading this you have got familiar in downloading Aadhaar Card if you had any problems during downloading process of Aadhaar Card you can comment below or also you can share you experiences. i have forgot my ID through which i have order a mobile from flipkart and now i need to take my mobile to the service center…. how can i get my bill without mobile number and ordered ID…???? To get your invoice you will have to login to your Flipkart account from which you have ordered the product, without that you cant get it. Alternatively try calling Flipkart Customer Care they might be able to help you better.